​QUALITY SERVICE is not the same as FIDUCIARY SERVICE. Any salesperson or service provider can deliver high-level quality service. Fiduciaries move to a higher level of accountability – taking responsibility for and acting in the best interest of their clients. We are so committed to meeting your sales objectives in a professional and pleasing manner that we are willing to put our guarantee in writing. Call us today to begin on your path to selling your home! What’s Your Biggest Fear When Listing Your Home? We understand that timing is extremely important in the real estate market. A property attracts the most attention, excitement and interest from the real estate community and potential buyers when it is first listed. Therefore finding the right price and staging the home correctly is vital to achieving your sales goal. Location – Location is the single most important factor in determining value. Condition – Prospective buyers often make decisions based on emotion. First impressions count! Optimizing appearance maximizes value. Price – Effective pricing can determine the length of time it will take to sell your home. 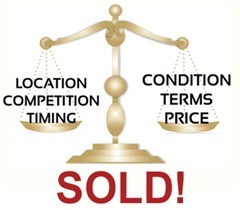 Competition – Prospective buyers compare against competing properties and what has already sold in your area. Timing – The real estate market cannot be manipulated. A marketing plan should analyze current conditions. We know that choosing a Realtor® to sell your home can be a challenging process. You want an agent who COMMUNICATES and can deliver. We’d love the opportunity to meet with you to show you what we can do for you!